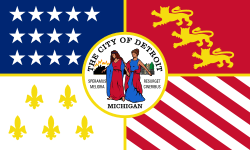 The City of Detroit has left whole areas without street lighting and even proposed allowing buildings to burn rather than spend the money on fire fighters. However, the city is now facing a $1.1 million default judgment in a civil rights suit after its attorneys failed to respond to the lawsuit. Caleb Sosa, 19, filed a discrimination lawsuit alleging that he was coerced at age 14 into signing a confession that he neither read nor understood. He says that he is entirely innocent and spent two years in juvenile detention before he was acquitted at trial. The case was before U.S. Judge Sean Cox. The city has refused to comment on why it essentially did not show up. It would seem that the citizens of Detroit deserve an answer. If the city saw no defense, why didn’t it negotiate a settlement rather than pay the full demand for damages? Otherwise, this would appear to be negligence. The case has been declared to be a matter of “malpractice” and City Attorney Jane Mills is no longer working for the city. Sosa was arrested and interrogated at 13 after a murder in 2007. Another surviving witness identified Sosa as the masked gunman. Are you asking me? I’ll assume to. My guess it that it is the same reason that the nation is in such bad shape, just a smaller pond.